Home GUEST DOODLEWASH: Flower Party! These doodlewashes come to us from Corinne Bekker in Utrecht, The Netherlands (follow her WordPress blog!). She was born in Rotterdam and currently lives in Utrecht, right in the center of the Netherlands, with her life partner David and their 16-year-old son. My watercolors were all done in the month of October. These flower watercolors fit in a plan of doing daily art for at least a year, under the name ‘the Year of Daily Creating’. I started out taking on a new theme every month. The theme for October was ‘Flowers and flying critters’. For the watercolor flowers I started out on the basis of an example from a class I had taken last year, painting a flower that was nearly white. Leaving a lot of white in the painting is actually quite a challenge, and then to mix the right warm and cool grays to paint the shadows on the white. I would love to be able to do a lot more of these and slowly move into more vibrant colors. But then October is gone, and I love using other media too. I am a bit of a restless type, I guess. I also love using mixed media and I have just started painting in oil paint. I am stunned about the possibilities of this medium. But don’t worry, I will not forget the watercolours. First, I love the transparency and color of this medium. Also I love to hear the sound of the brush on paper and in the water. It is a thing of the senses. No other medium is like watercolour on these aspects. I have become really passionate about doing art regularly in recent times. I have this dream of teaching drawing and having my own studio, making big paintings in acrylic and oil. But in my current life I have a business doing fundraising for charities. I have been working in other fields (research, writing, communication) for at least 25 years, and though I feel the call of art, I have a bit of a struggle fitting it in my life. I started drawing and painting again in 2011 – after about thirty years of doing hardly any art. Anything to do with drawing, painting or craft at that time was mostly art work at school, until I was 18 and left home. I did keep doing modern and jazz dance classes until 1999 when I was expecting. When my son was born in 1999, I needed to go back to work at the University soon, to finish writing my phD. I didn’t have much time for any kind of art or craft. Somewhere between 2005 and 2011, I began to feel a craving for color. It was a yearning, like a soft whisper. An afternoon workshop on intuitive painting in 2011 started me on a new path allowing me to reconnect with art. My reconnecting with art started slow. I discovered a painting teacher in a nearby town. In her studio we studied French , Italian, Spanish and German artists from the early 20th Century, like Cézanne, Matisse, Gauguin, Picasso and Braque. On Twitter I discovered a wonderful drawing and painting teacher, Carla Sonheim. Carla is a wonderful teacher who knows how to make learning about drawing fun. In 2013 I joined my first year long online class with her (Year of the Giraffe). From then on I wanted more and more. 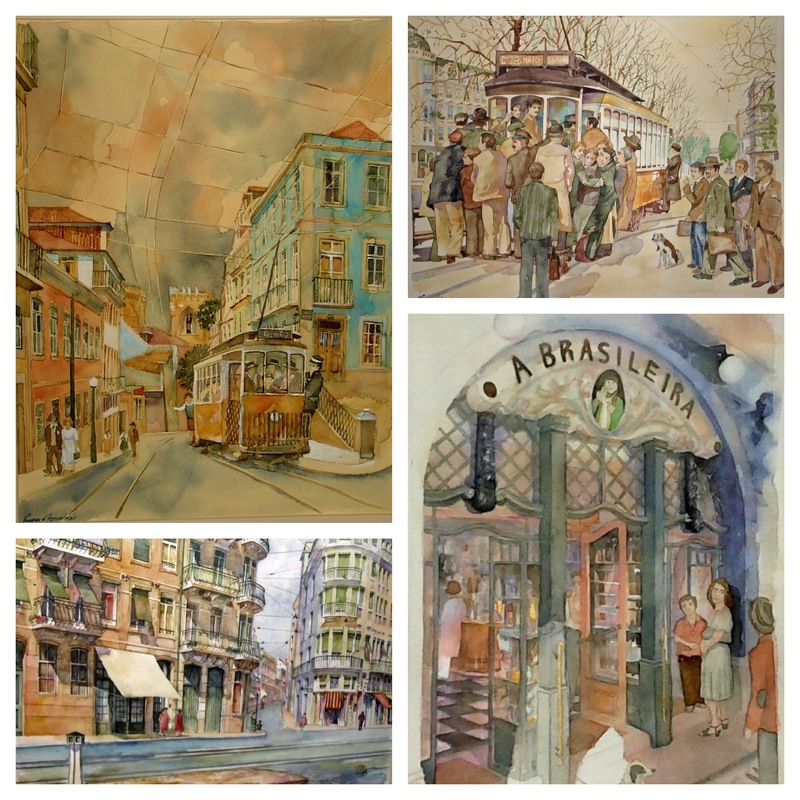 In 2013-2014, I started watercolor painting, first by taking online watercolor classes of Fred Lisaius and Val Webb. I’ve been hooked ever since. I’ve started experimenting by adding other media – such as ink – and taking on new subjects. Apart from watercolor I am rather passionate about drawing. From the first drawing course from Carla Sonheim, drawing has gradually taken on so many meanings for me. It helps grow my painting skills of course. It’s a way to help me look at the world in a new way. It furthers my creative side. But also it helps me to relax. The longer I do it, the more I start to see how enriching a drawing practice is for me. I love to share that. So I am really happy that in 2014, I was asked to teach my first live workshop. I wouldn’t have started it yet if this hadn’t happened. Since then I have taught a few times more. I love to pass on what I’ve learned. All in all drawing and watercolor are my go-to art techniques. For subject matter I like doing abstract, but also flora and fauna and imaginary creatures. Among animals, birds are also a favourite subject of mine. In September I started a Year of Daily Creating. I really want to have a daily art practice in order to grow my art skills and grow a body of work. I know from the example of other artists that their work grew and it changed their lives. If I am honest, I am hoping for that change too. It’s been quite a big step and a big change already during the first two and a half months. I had been taking a lot of classes over the years and started to feel I was dancing to other people’s tunes all the time. Every time I want to dig deeper, we move to a new subject. I want to find out what my own tune is. By doing daily art, I hope to find out. 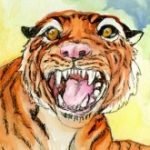 There are many examples of people doing daily art, and by starting to do it and blog about it , I have found more and more of them. So glad I did, and that I found the doodlewash site. For fulltime artists doing art daily is probably not so special. But I am working as a self-employed fundraiser and fundraising consultant by day – and fitting in the art daily is a bit of a struggle. Having other daily art makers feels like I have a support group, people to both inspire and get inspiration from. You can find out more about my art and the Year of Daily Creating on my blog. From some of my artwork, I have art cards printed. Please check out my Etsy shop. Beautiful, loose paintings! I especially like the bird in the pink background! There are so many of us who rediscovered the joy of drawing later in life. Love, love, love the expressive bird paintings! She sure has a nice way with colors! Very pretty. Beautiful paintings, love the black birds pieces, nice wet-into-wet effects. Her comment about painting being “a thing of the senses ” is so spot on. Thank you for featuring such a hardworking talent. Beautiful work! Thanks for sharing Charlie! Yay Cathe! 💕😃Glad you liked Corinne’s work! What a challenge! I’ve done a daily for 10 days, and did a painting every week for a year, but daily over a long period? Amazing. And such beautiful work too! I love the looseness in your paintings! they are delicate and beautiful. I enjoyed your story and your art. Loved the crow in the colourful sky!